Netflix stock passed the $100 per share mark this morning, for the first time since last April. The company's stock price still has a way to go to get back to its peak price of about $275 per share back in early 2011. But things are looking up for a company that has managed to weather a pretty bad year. (A year which, let us be clear, was bad because of the company's own devising.) And some analysts warn that the $100 per share price represents an overvaluation of the stock. 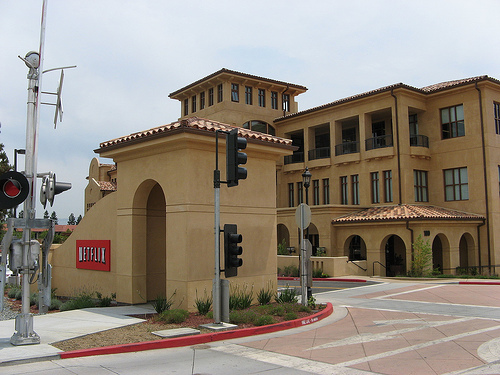 Nevertheless, I bet there have been a lot of smiles around the Netflix corporate offices today. Part of the boost to the stock price came with the Monday announcement that Netflix had signed a deal with Time Warner. It will only bring eight television shows into the Netflix fold, but it seems like a good sign. Maybe Netflix is finally getting its foot in the door, content wise, and more arrangements with Time Warner will follow. All of these shows have new episodes that are currently available on Hulu, with the previous seasons being available on Hulu Plus. Which means that this announcement is making things look a little bit grim for Hulu. Not to mention the fact that Hulu's CEO recently announced that he is stepping down, which will throw the company off its game until a new CEO can be found and broken into the job. The fight over content is really getting vicious. Amazon recently announced that it will test out $7.99/month price for its Prime service, which would include streaming video. The price is meant to position it as a direct competitor to Netflix. But having sampled the video selection for offer with Prime, I can tell you that it is pretty lousy. Only a very small subset of video is available in the Prime library. The same stuff, for the most part, that is available on Hulu Plus and Netflix Streaming. Of course, Amazon's offering also brings all-you-can-eat free two-day shipping with that $8/month price tag, which can sweeten the deal. It seems like Netflix is facing tough competition on every side: Hulu, Amazon, Google, Redbox and Verizon are all duking it out with the red envelope for the hearts and minds and wallets of subscribers.